DeepFeet Alumni receive 20% discount off all Lacuna CBD Massage Creams, Elixirs and Cosmetics. DeepFeet has partnered with Lacuna Botanicals to incorporate cutting-edge CBD products into your practice! I’ve been a Massage Therapist and Esthetician since 2001. My passion for the industry has never lessened over the years. I have worked with 25 of the top massage and skin care lines in the business and have very particular guidelines on ingredients, sources and ethical background of companies I’ve worked with. n 2016 I started working at a Barber Lounge and provided Facials and Massages to the clients. All of them wanted deep tissue massage and I found myself feeling very fatigued with wrist and lower back pain. Little did I realize there were already Ashiatsu Bars in one of the massage rooms. After discovering this, I had to go and take the class and learn how to not only deliver relaxing deep tissue massage to my clients but save my body at the same time! Everything changed after learning Ashiatsu. Since learning this modality, I’ve literally never used my hands for a massage again. With a background of training Massage Therapists and Estheticians, I really took to Ashiatsu. They needed an instructor for the Denver area, so I jumped on board! In the spring of 2018 I had a booth at the AMTA Colorado chapter event. We enjoyed people gathering around our booth to take a look at someone using their feet to massage people! It was amazing showing them how to deliver this modality where everyone wins. We happened to be right next to the Lacuna booth. 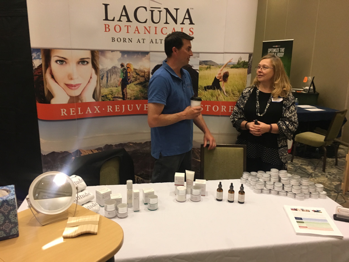 I was listening to the Lacuna team talk to therapists about the benefits of CBD. I had heard of it, but like many others, didn’t yet have much experience with it. They had samples of the Deep Tissue cream and I just had to try it out while working on my client. I started to use it and the glide was just perfect for this Ashi. As I was working, my client made a point to tell me how she really liked the effects of the product. She said it took her migraine away almost immediately. So, my ears perked and my head tilted with ideas of how I can really up my Ashi game while using this beneficial product and share knowledge of what CBD is and the benefits. Not only was I extremely interested in the Deep Tissue cream, but I’m obsessed with skin care products. I asked for a few samples and researched the ingredients and started using the Anti-Aging Daily Facial Serum, Anti-Aging Nightly Facial Cream, and the Anti-Aging Eye Cream. I saw results immediately and cannot live without this luxurious product on my skin. I love to share my passion with like-minded others. After getting to know the Lacuna team and their families I decided this was for me. I know CBD is very new to most of us here and I believe this natural approach can really change the way people feel not only on the inside but out as well. LOVE MY LACUNA!